If not, don’t be surprised when they start showing up at your tables or bars: small groups of men getting together to enjoy some male bonding over glasses of pink wine. 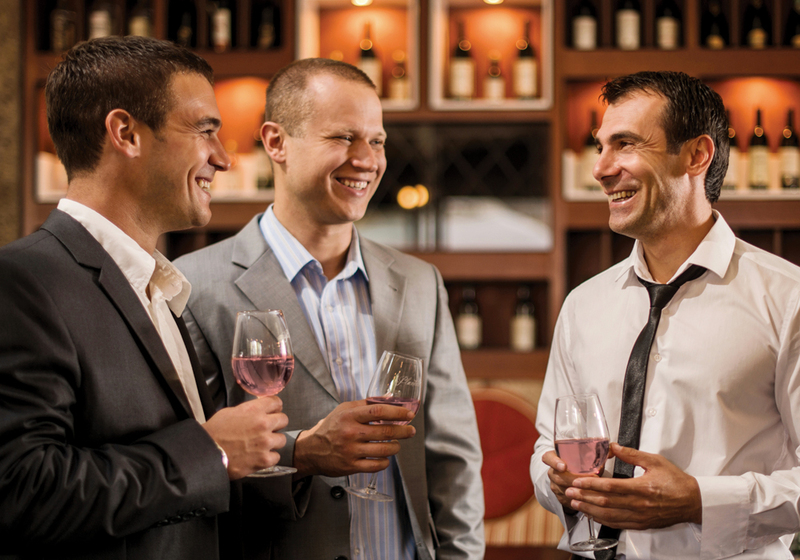 Some male rosé fans, having read the piece in Details magazine last June that examined the burst of interest in pink wine among men, are proudly proclaiming their brosé credentials. Whether many male customers are self-identifying as brosés or not, it’s only one sign of the recent pink bloom. Rosé wine exports from Provence—the key exporter of pink to the U.S.—grew 58% by volume and 74% by value in 2015, according to the French customs agency and the CIVP/Vins de Provence trade group. The rise marks the largest increase in Provence rosé wine exports to the U.S. since 2001, as well as the 12th consecutive year of double-digit growth for the segment. According to Nielsen data, imported rosé priced at $12 or more per bottle nearly grew as much, up more than 56% by volume and 60% by value last year. Provence rosé currently accounts for more than 40% of French rosé sold in the U.S., and about 30% of imported rosé. Many bars and restaurants have taken note of the shift to pink and are increasing the number of wines carried and bumping up their order volume.They’re also looking outside the classic rosé realm to other regions such as Greece and Portugal, and strategizing how to make their suddenly limited allocations last through to the end of summer and beyond. “In the last couple years, we’ve seen a lot more men drinking rosé,” says Mackenzie Campbell, wine director for the Caswell Restaurant Group in Newburyport, MA. A welcome sign of the warm weather, rosés are in fashion for pairing well with lighter and Mediterranean cuisine. They’re generally all-around popular with sommeliers and wine directors for their food friendliness. The weather, of course, is the most significant stimulant for rosé sales. The Bristol features seven or more sparkling rosés and eight still varieties from France, Corsica, Italy, Sicily, Spain and Lebanon. “When springtime comes around, it’s all about rosé. And not just the usual French rosés, but beautiful pinot noir rosés as well,” Ford says. Campbell, who oversees Ceia Kitchen + Bar (where she encountered the pack of brosés), as well as Brine in Newburyport and the soon-to-open Oak + Rowan in Boston, sells about 100 cases of rosé in the summer selling season. She rotates through various types of rosés: French, Spanish, Italian, domestic and some lesser-known selections from Greece and Portugal, among other regions. While the cuisine at Claudette fits best with Provence style of rosé, other operators are casting a wider net by looking around for wines from other regions. The all-Greek wine menu at Molyvos in New York creates numerous pink opportunities. The midtown restaurant carries 12 rosés, most available by the glass, made from Greek varietals including moschofilero, agiorgitko, xinomavro and mandilaria, says wine director Kamal Kouiri. Most of the rosés are indigenous grape varieties, though some are blends with international varietals to show what Greek winemakers are doing. “With more familiar grapes, customers are more willing to try, and that gives them an entry point to both Greek winemaking and rosés,” Kouiri says. “Greek cuisine is helped by rosé and vice versa. I do well with them all year long; in winter, those that are a little dryer and bigger can handle moussaka or lamb better,” says Kouiri. Rosé sales may accelerate in warmer weather, but many sommeliers, especially in seafood and Mediterranean cuisine restaurants, are extending the season. At Claudette, “We try to keep it going year round because our cuisine is southern French-Moroccan, and they match perfectly” with rosé, says Porpiglia. “Some are harder to get ahold of, but we also carry some older, higher-end roses that can last a few years in a bottle and we sell them year round,” he notes. While Porpiglia thinks a fine rosé might peak priced at about $55 per bottle, the occasional connoisseur may take the plunge and spend more once in a while. Cuisine aside, rosé has found some wintertime success—even in the frigid Midwest. “We went through almost ten cases of rosé last winter. For a small restaurant, that’s incredible, considering it’s usually freezing cold out here then,” says Ford.